For most of us, sleeping time is just that—time to doze off and recuperate for the day ahead. Most of us keep to ourselves, as being unconscious isn’t the most productive time for deep conversations. Others, however, are regular chatterboxes, and can be caught flapping their gums throughout the night. Pair a weird subconscious mind with sleep-deprived mumblings, and comedy ensues. Here’s some of our favorites! 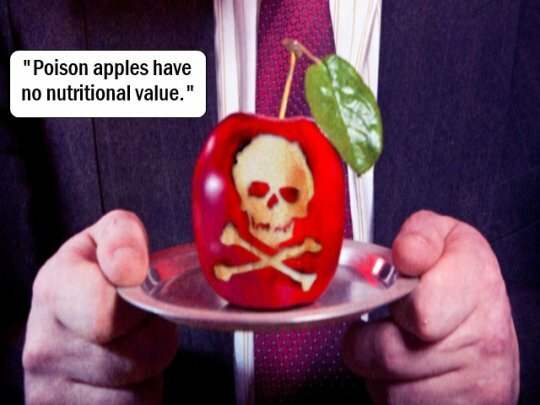 #1 - Your subconscious mind is good for helpful nutritional tips. 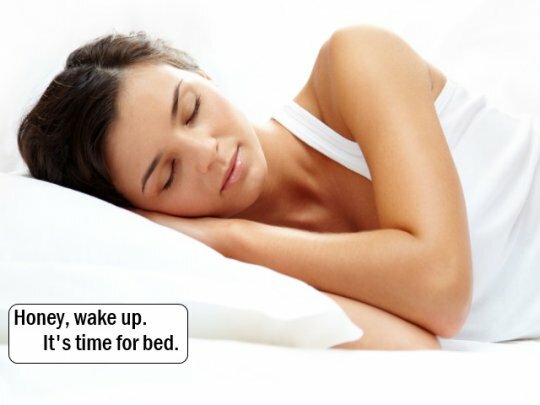 This sleeptalker knows what’s up. Whether they’re shopping for food at the supermarket or fending off the attacks of an evil stepmother, they’re on top of their game. #2 - Your subconscious mind is not good for sleeping tips. Wait, walk me through this one, sleeptalker. If it’s time for bed, shouldn’t I be asleep? But then, I suppose, if I was asleep, I couldn’t do what you asked. But you’re asking me to go to sleep…I think this plan needs to go back to the drawing board. #3 - The force is strong with this one. 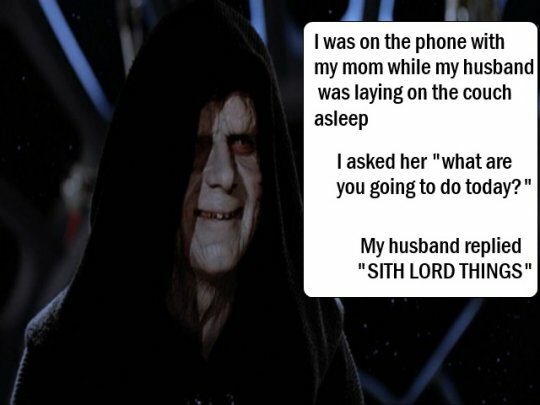 If only they knew the power of the Dark Side. This is probably not the most comforting answer someone can give to this question, though hopefully it will amount to nothing more than “fail at all of our evil plans due to shoddy evil lair construction”. #4 - Their so-called waffle superiority has gone too far! 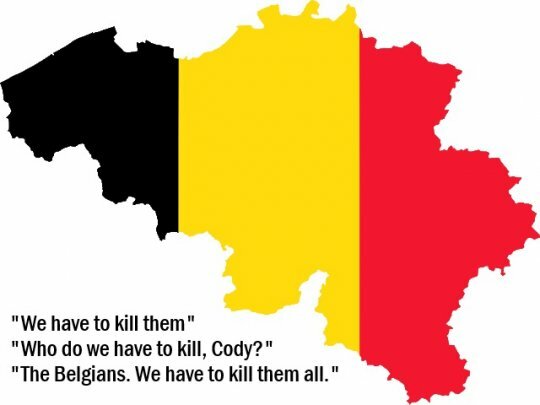 Of all the countries in the world to harbor a deep, subconscious hatred of, why Belgium? Too much of The Smurfs or Tintin as a child? An aversion to high-quality beer? One too many Jean-Claude Van Damme movies? #5 - An unforgiveable act of food thievery. Some things are clearly unforgivable. It’s bad enough when the mother-in-law comes to visit, but to steal your hot dog, right when you were about to chow down? That’s worth some serious karmic payback! 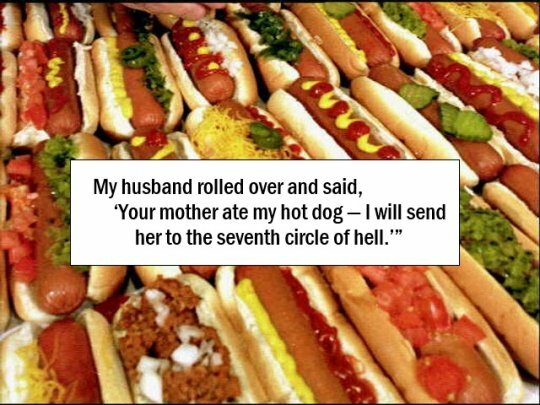 I especially love it specifically being the seventh circle of hell—so specific! The story goes that Paul McCartney had the melody to “Yesterday” come to him in a dream. 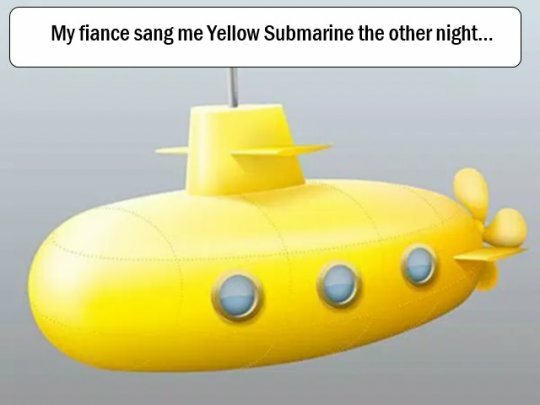 Poor Ringo Starr only gets “Yellow Submarine”, which you will now have stuck in your head for the next four days. Sorry about that. #7 - Bigfoot doesn’t hold a candle to a man with a plan. This one almost makes a strange kind of sense. 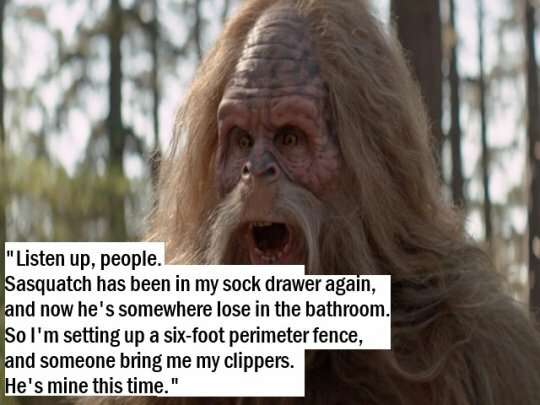 After all, what else would a sasquatch be on the prowl for other than footwear? 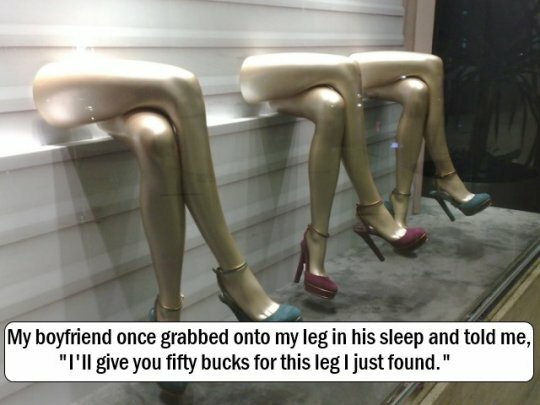 #8 - Getting a leg up on the black market. I’m not quite sure this sleep-talker understands how the economy works. If you find something valuable, you’re supposed to sell it to people! With dream logic like this, it will be no surprise when this poor guy’s dream business goes underneath. Such is the pressure of the current dream economy. #9 - Seriously, get them ready! We have a job to do! I want to live in this woman’s dreams—there’s clearly some kind of sci-fi secret-agent high-pressure mission going on in there. 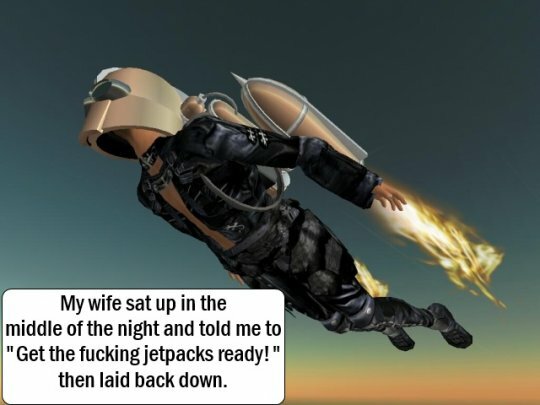 Who knows what kinds of crazy space-age adventures she’s getting into? #10 - Who could hate a poor widdle puddy cat? 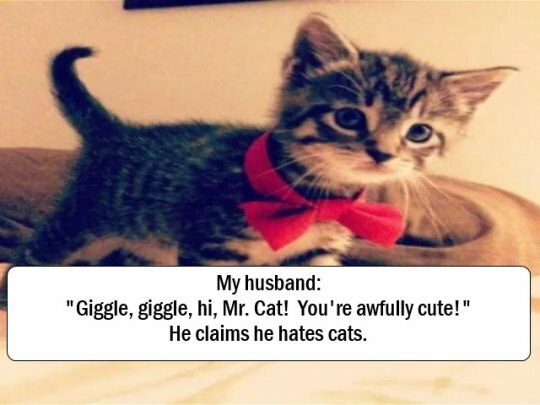 This woman’s husband claims that he hates cats, but his subconscious clearly is suffering from an acute case of feline withdrawal. Doctors prescribe 100cc of cute cat photos twice per day, which fortunately are available from nearly any site on the internet, nowadays. #11 - This wasn’t in my job description. Look, when you hired me, it was very clear what I was qualified to do. I work on the computers, I take care of programming and quality assurance, and I handle customers. 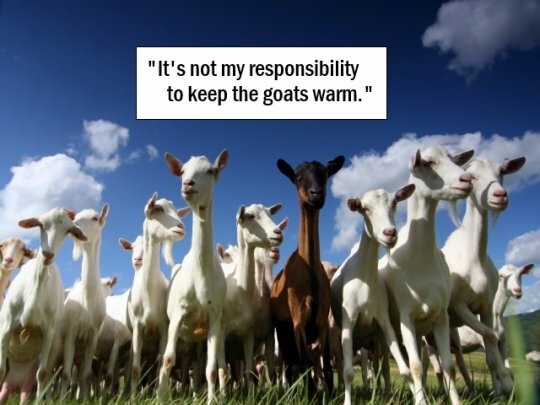 When I was told I may be working with kids, nobody mentioned anything about them being the goat kind. #12 - Sir Cluckington and Lady Cuckoo would be mortified. If you’re throwing a fancy dinner party, it’s important to keep it very clear what is made for dinner and what is actually your guests. In the waking world, this is fairly simple, unless you’re a secret cannibal. In dreams, however, things can be a little more fluid.